Exciting intellectual frontiers are open for exploration as agenda-setting theory moves beyond its 25th anniversary. This volume offers an intriguing set of maps to guide this exploration over the near future. It is intended for those who are already reasonably well read in the research literature that has accumulated since the publication of McCombs and Shaw's original 1972 Public Opinion Quarterly article. This piece of literature documented the influence of the news media agenda on the public agenda in a wide variety of geographic and social settings, elaborated the characteristics of audiences and media that enhance or diminish those agenda-setting effects, and cataloged those exogenous factors explaining who sets the media's agenda. In the current volume, a provocative set of maps for explicating new levels of agenda-setting theory have been sketched by a new generation of young scholars, launching an enterprise that has significant implications for theoretical research and for the day-to-day role of mass communication in democratic societies. * to enhance the discussion of agenda-setting research in seminars and research groups around the world. Agenda-setting has remained a vital and productive area of communication research over a quarter century because it has continued to introduce new research questions into the marketplace of ideas and to integrate this work with other theoretical concepts and perspectives about journalism and mass communication. Understanding the dynamics of agenda- setting is central to understanding the dynamics of contemporary democracy. This book's set of theoretical essays, grounded in the accumulated literature of agenda- setting theory and in the creative insights of young scholars, will help lead the way toward that understanding. Contents: Prologue: "The Game Is Afoot." Part I: The Pictures in Our Heads. S. Ghanem, Filling in the Tapestry: The Second Level of Agenda-Setting. T. Takeshita, Exploring the Media's Roles in Defining Reality: From Issue-Agenda-Setting to Attribute-Agenda- Setting. P-T. King, The Press, Candidate Images, and Voter Perceptions. A. First, Television and the Construction of Social Reality: An Israeli Case Study. L. Willnat, Agenda-Setting and Priming: Conceptual Links and Differences. Part II: The Agenda-Setting Process. J-H. Zhu, W. Boroson, Susceptibility to Agenda-Setting: A Cross-Sectional and Longitudinal Analysis of Individual Differences. M. Roberts, Political Advertising's Influence on News, the Public, and Their Behavior. D.J. Blood, P.C.B. Phillips, Economic Headline News on the Agenda: New Approaches to Understanding Causes and Effects. W.J. Gonzenbach, L. McGavin, A Brief History of Time: A Methodological Analysis of Agenda-Setting. W. Wanta, The Messenger and the Message: Differences Across News Media. Part III: News Agendas and Social Systems. D.L. Lasorsa, Media Agenda-Setting and Press Performance: A Social System Approach for Building Theory. E. Caudill, An Agenda-Setting Perspective on Historical Public Opinion. A. Rodriquez, Cultural Agendas: The Case of Latino-Oriented U.S. Media. H.A. Semetko, A. Mandelli, Setting the Agenda for Cross-National Research: Bringing Values Into the Concept. D.L. Shaw, B.J. Hamm, Agendas for a Public Union or for Private Communities? How Individuals Are Using Media to Reshape American Society. "The writing is clear and consistent, a quality not always evident in edited books, and the content is sophisticated, appropriate for use in a graduate seminar." "Taken together, the book is a must for political communication researchers, especially when it calls for further discussion of the concepts that guide our future research agenda." "This book, edited by the founding fathers of agenda-setting studies, puts the spotlight on the continuing evolution of agenda-setting theories. 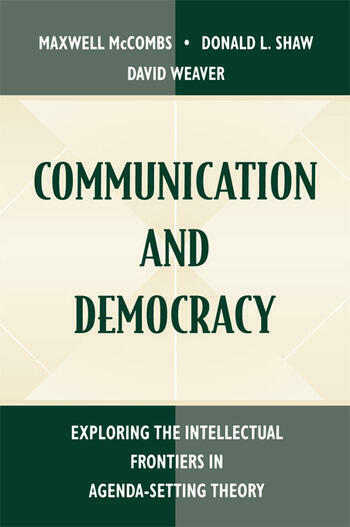 Featuring the work of a diverse group of young scholars, the book exemplifies the lively scholarly dialogue about the interplay of mass media offerings, audience reactions, and public policies in democratic societies. Quite obviously, the agenda-setting approach has lost none of its vigor since its inception 25 years ago. It continues to be an extraordinarily fruitful way to investigate mass media impact in an era of explosive growth of mass communications."